Sarah Bakos-Killian, who interned for the World Wildlife Fund for two semesters her junior year, expects to graduate in May 2019. “The most valuable thing I learned from my internship is that risk management principles can be applied to nearly any industry or interest, so there is endless opportunity,” she says. Jake Grindstaff has had three summer internships: with the D.C. Department of Insurance, Securities and Banking in 2016; with NFP Insurance Agency in 2017; and with Marsh in 2018. “Those internships have taught me so much about myself and the workplace in this industry,” he says. The experience increased his confidence in his work performance, in addition to helping him focus on what kind of job he’s interested in post graduation. 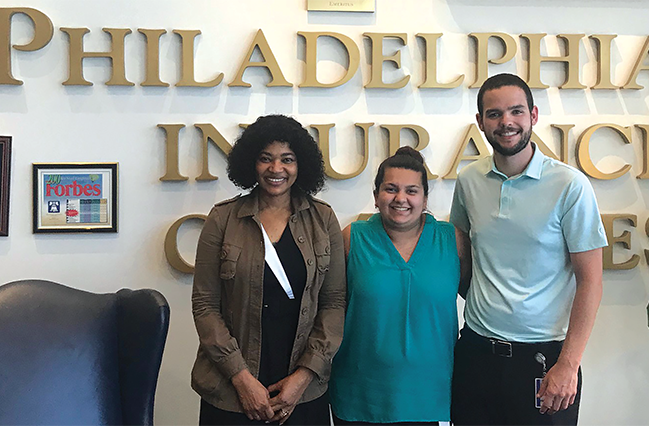 Nabeela Shollenberger spent 10 weeks as an intern in the underwriting department at Philadelphia Insurance Companies. In addition to learning about a great variety of projects, she particularly enjoyed a women’s networking session, and she had the opportunity to get out of her comfort zone and give a presentation to department heads and the CEO. Montray Roberts was an intern at AHT Insurance in the spring of 2018. He expects to graduate in December 2019 and hopes to explore a variety of careers in insurance, including being a broker and actuary and working in risk management. One of his projects at AHT involved creating a game for the many kids who attend Take Your Child to Work Day so they could learn about insurance.